The UK carried out its first drone attack on Islamic State militants in Iraq over the weekend, the Ministry of Defence has said. An RAF Reaper drone was involved in coalition missions near Baiji, the site of Iraq's largest oil refinery. The MoD said the drone "successfully attacked" militants who were laying improvised explosive devices. Britain is one of about 40 nations involved in the fight against IS, which controls parts of Iraq and Syria. The UK launched its first air strikes against IS targets in Iraq on 30 September - four days after Parliament approved military action. It has also sent military trainers to help local forces in their efforts to halt the advance of IS. BBC defence correspondent Jonathan Beale said it was the first time a Reaper drone had also been used to carry out an airstrike. 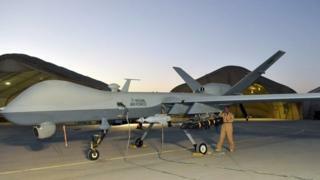 "The MoD are still not saying how many Reapers have been redeployed from Afghanistan to the region," he added. "It's understood the remotely-piloted aircraft have conducted more than a dozen sorties over Iraq so far - mostly in a reconnaissance role." The MoD said RAF Tornado jets were also involved in airstrikes near the oil refinery in Baiji over the weekend. The town, about 200km (130 miles) north of the capital Baghdad, was seized by militants in June but they failed to capture the refinery. On Sunday, officials said Iraqi government forces had regained large areas of the town. An RAF aircraft also destroyed a shipping container west of Baghdad, on Sunday morning. The MoD said the container was "used by the terrorists to store equipment to support extortion and control of the local population". Last week, Defence Secretary Michael Fallon said the UK would be sending more military trainers to Iraq. A dozen British trainers have already been deployed to work with Kurdish forces in the northern city of Erbil. On Sunday, the US announced it was sending another 1,500 troops to Iraq. US President Obama said the deployment of the non-combat advisers marked a "new phase" in the fight against IS.